Tesla was a scientific genius born 1856 of Serbian parents in the village of Smiljan, in what was then the Military Frontier of the Austro-Hungarian Empire and is now part of Croatia. In the 1880's Tesla immigrated to the U.S., where his revolutionary innovations made possible the productive use of alternating current. His patented Polyphase Alternating Current System was employed by Westinghouse to build the titanic generating plant at Niagara Falls (completed in 1893) and, for the first time, transmit electrical power over a distance of many miles. Tesla also invented the wireless telegraph. Marconi 'stole' Tesla's patented technology and still gets all the credit, even though the U.S. Supreme Court decided the dispute over these patents in Tesla's favor in 1943. 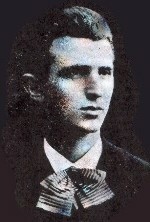 Tesla had extraordinary mental powers. He often slept only two hours per night, sometimes not at all, and designed the most complex devices in his mind, without need for blueprints or experimentation. Under the strain of visualizing his greatest invention (the Rotating Magnetic Field), Tesla experienced a profound psychic disturbance which he called a 'breakdown', but which fits the description of a Kundalini awakening. Tesla followed the direction of the Swami Vivekenanda, who instructed him in the mystical understanding of Prana and Akasha, the fundamental forces of the Universe. Awakened to the importance of channeling his vital energy, Tesla embraced celibacy and devoted his life to scientific achievement. He never married nor had children. Tesla dedicated his life to the betterment of the human race through the production of electric power. It was his ambition to create a World System of wireless power to broadcast free energy to all corners of the globe. He claimed he had developed the technology to do this, but that his efforts were thwarted by the 'corporate men' who derived their great personal wealth from selling power -- without wires, there would be nowhere to 'put the meter'. In 1901, he began construction of a two-hundred foot tower (pictured to the right) at Wardenclyffe on the shore of Long Island, but when his backers (including J.P. Morgan) learned that he planned to broadcast free power, they refused to offer furthersupport. The tower stood unfinished til July 4, 1917, when it was dynamited by locals who, in a misplaced frenzy of wartime patriotism and paranoia, imaginedthey were wiping out a nest of German spies.